Figure 10-18. 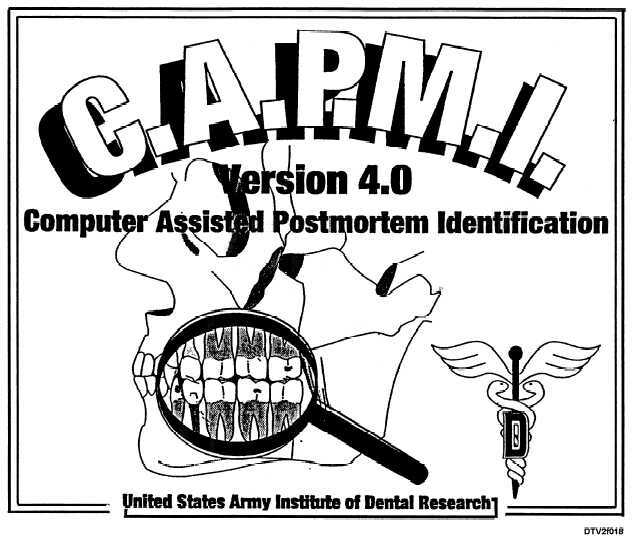 - Computer Assisted Postmortem Identification (CAPMI). presented their evidence and all inconsistencies have been explained or addressed should the Identification Center chief sign the case out as a positive ID. After the case has been signed out as a positive ID, the antemortem and postmortem dental records and associated evidence should be combined with the summary sheet into a single completed file. The antemortem composite dental record should be placed in the completed file only if the full dentition was present with the remains or if all dental/oral fragments have been recovered. If this is not the case and an additional oral fragment is recovered, thepostmortem fragment may go unidentified since the necessary antemortem dental record was placed in the completed file. This mistake is made in almost every disaster. Please avoid it! In the consolidation process, the antemortem and postmortem dental radiographs that provided the conclusive evidence of the positive dental identification should be photographed. These photographs or slides are indispensable for record keeping purposes and provide a superior method of displaying the evidence in court. The following equipment, supplies, and facilities as listed in Tables 10-1, 10-2, and 10-3 are recommended for use in forensic dental operations. The items mentioned below are only a recommended list. Most of the equipment and supplies can be maintained in a medium-size tackle box and canvas bags for immediate availability and easy transport to the ID site. Your command should plan to add or subtract items or change quantities according to your local requirements.